Online Air Force Officer Qualifying Test (AFOQT) Prep. Welcome to AFOQT Academy, your resource for web-based AFOQT Practice Test time constraint training. As you may know the Air Force Officer Qualifying Test (AFOQT) is a standardized exam comprised of 310 questions divided (un)evenly across 11 timed subtests (not including the Self-Description Inventory Subtest). 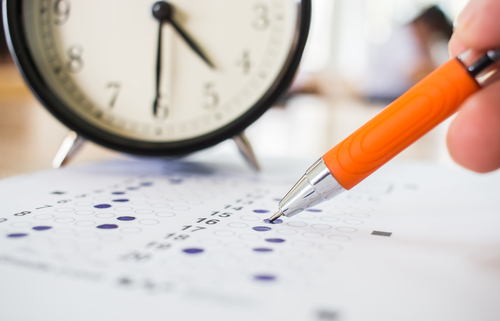 In addition to having a firm grasp of the material (i.e., types of questions) you will encounter on test day, conditioning yourself for the time constraints of each subtest is the greatest advantage you can give yourself. It is these two objectives, repeated exposure to realistic AFOQT practice test questions & subtest time constraint training, that have shaped and facilitated the creation of AFOQT Guide and AFOQT Academy. These two resources give you, the future Air Force Officer, access to 1200+ peer-reviewed AFOQT Practice Test questions, 11 AFOQT Study Guides, a Free AFOQT Practice Test and a learning management system that forces you to complete each subtest within the allotted time. You will be taken to the academy test page and required to input your email prior to taking your free sample test. Short on Time? Put Your AFOQT Prep in Your Pocket and Go. Provide you with the most realistic AFOQT test-taking experience possible. Are available in web-based quiz module and PDF formats to ensure you’re conditioned for test day time constraints and familiar with the paper based standardized test you’ll see on the day of your test. How Can AFOQT Academy Help You Prepare for Test Day?